Pao Houa Her is recognized for her provocative photographs of the Hmong, the indigenous people of Laos who immigrated to the United States following the Vietnam War. Highly personal, Her’s images are not only a narrative extension of her own experience of being born in Laos in 1980 and then fleeing the country with her family at age three, but they also sensitively document the larger ethnic Hmong culture that became increasingly established in various locations in the United States in the late 1970s and 1980s. Although most of Her’s life has been spent in Minnesota, she remembers vividly the long migration from Laos to camps in Thailand and, finally, on to Saint Paul where Her’s family settled in 1986. This immigrant experience as a young child, and later growing up in a metropolitan area settled largely by Scandinavian, German and Irish immigrants, is the literal and conceptual foundation of Her’s photographs. Drawing on the traditional Western genres of portraiture and still life, Her eloquently photographs contemporary Hmong culture, such as youth at festivals and gatherings or the elderly in their homes, and her self-portraits in domestic settings are at once frank and emotionally revealing. A recent series of images depicting flower arrangements in striking black and white suggest scientific documentation in their specificity. Her’s richly hued portraits of stoic Hmong Vietnam War veterans are notable for their aesthetic perspicuity and cultural discourse. During the Vietnam War, the CIA and the U. S. Government backed the Hmong to fight the North Vietnamese in Laos’ treacherous landscape. This heroic military strategy on the part of the Hmong soldiers is known as The Secret War. Following the war, many of these men and their families immigrated to the United States. Today, their service is still unrecognized by the U.S. military and, thus, these soldiers solemnly honor each other’s heroism by attending meetings in full uniform. That Her’s father valiantly fought the communist Vietnamese and Laotian military that were massacring the Hmong after America exited Viet Nam, before fleeing with his family, puts a tightly focused, personal lens on this difficult subject. Pao Houa Her was born in 1982 in Laos, and was raised in Saint Paul, MN. She currently lives in Lino Lakes, MN a suburb of the Twin Cities. She received a MFA in Photography from the Yale University School of Art, New Haven, CT in 2012 and a BFA in Photography from the Minneapolis College of Art and Design in 2009. Her received a Jerome Fellowship for Emerging Artists in 2013 and was awarded Initiative Grants from the Minnesota State Arts Board in 2009 and 2012. She also received an Alice Kimball Fellowship in 2012. 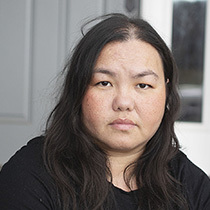 Since 2012, Her’s photographs have garnered solo exhibitions at the Minneapolis Institute of Arts, Franklin Artworks in Minneapolis, the Eli and Edythe Broad Art Museum in East Lansing, MI, and the Center for Hmong Studies, The Gordon Parks Gallery and The Bindery Projects, all in Saint Paul. Her’s photographs have also been featured in group shows at the Telemark Art Center in Skein, Norway, the Minnesota Museum of Art in Saint Paul, the Museum of Contemporary Photography in Chicago, IL, and the Camera Club of New York in New York City, as well as in galleries in New York and Los Angeles.